Analysing performance First touch Preparation - Hands are the correct distance apart, although I should have my fingers all touching when round the stick, but I have my index finger pointing down the stick, this is a bad idea as its usually how fingers are broken. - Knees bent and left foot forward, giving me a low strong body position. - I move to meet the ball in the correct position however I don't actually move forward towards the ball, so in a game situation it may then be easily intercepted. - I make sure I know where I'm going to pass the ball next. - I need to move my feet round more sometimes so that I receive the ball on my open stick side rather on the reverse stick side (it is better to do this because it is easier and quicker to pass from the open stick side. If you then get tackled, then it is your strong side and so you are more likely to keep the ball). To do this I need to anticipate where the ball is going to go by watching the player, which is passing the ball, position. ...read more. Because I can do a push pass effectively it means that I can also flick the ball if I want to, and I manage to keep the two separate passes separate so that I don't lift it too high accidently. - When I sweep (long handled slap) the ball, I follow through as I would any other pass however I should bring my stick round so that my right hand crosses over my left. Result and recovery - I move back into the correct position to receive any future ball. Or if the ball is intercepted I follow it up. Ball control Arm action - When I keep my stick on the ball you can see a clear increase in the amount of control I have, compared to when I let the ball roll of my stick and end up tapping it, which means the movement is less effective and fluent. - Also keeping the ball on my stick at all times is important unless I take it off purposefully in the case of a 'dummy'. By having my stick on the ball at all times it would allow me to 'feel' the ball and consequently I would not have to look down at it, but would be more able to look for any available passes. ...read more. - I will usually tackle at the last moment, however sometimes I do tackle too early and then the attacker can go around me and the move ends up being pointless, and it would have been more effective to channel them. - I often don't watch the attackers' actions closely enough and so end up missing the ball and doing a stick tackle. - I usually channel players, as it is a move that I have practiced lots in training, although as I cannot sprint really fast I sometimes can't keep up with the attacking player. Result and Recovery - If I get the ball, I sometimes pass it quickly, although I don't always think this out properly and it will sometimes get intercepted. Otherwise, I tend to keep the ball in my possession until I see a pass I think is appropriate. However, this means that I will tend to loose possession of the ball if I am then tackled. - When I don't get the ball, I always follow it up if I can, channeling the attacker until they pass it or I make a successful tackle. ...read more. Fitness Phase Here Grant and me decided to do our weekly lap of the running track just to get muscles working and to get warm for today's training. We did an hour in the gym this week too focusing on all aspects of the body, but mainly arm and leg, and again did 3 sets. As well as this we have a member of the club who analysis's performance and has details of the amount of chances given, shots in the air and the amount of shots and balls bowled on the leg side and offside. I am able to lift in the region of 75Kg on the bench press. 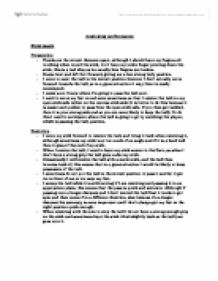 My strength and weaknesses sheets can be consulted at this point if there is any doubt as to what I aim to achieve and improve in the space of time allocated. In table tennis there are many rules which relate to several parts of the game, the service being the first. Service The service of the ball also has many regulations, one of these is that the ball must rest freely on the players' open palm, the hand must be motionless. Increased lactate may also interfere with cross bridging . These factors lead to a decline in both the force and velocity of muscular contractions. As clearly displayed above, lactic acid can severely inhibit your athletic performance if not cleared out of your system. Outcome of passes: Performers passes were weak and there was not enough power placed on the ball. Receiving passes: Performer uses a combination of both feet but is stronger with her left foot as she is left footed. However, when receiving the ball she sometimes loses control when using her right foot as this is her weaker foot.